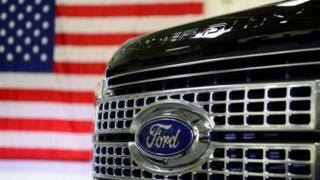 Ford is planning to cut around 10% of its global workforce in an attempt to boost profits, according to reports. Chief executive officer Mark Fields also wants to arrest the slide in the US car company's share price. The cuts, first reported in the Wall Street Journal, are part of a plan to save $3bn (£2.3bn) during 2017. Ford refused to confirm or deny the story, but said in a statement that it was focused on its plans to "drive profitable growth". It added: "Reducing costs and becoming as lean and efficient as possible also remain part of that work. We have not announced any new people efficiency actions, nor do we comment on speculation." Ford employs around 200,000 people, with half of them in North America. In March, the carmaker announced that it would spend $1.2bn (£927m) to upgrade three plants in Michigan in the US and create 130 new jobs. At the start of the year it cancelled plans to build a new factory in Mexico after pressure from President Trump, who had also criticised General Motors' plans to produce cars there. The company's share price has fallen by nearly 40% since Mr Fields took up his role in the middle of 2014. Earlier this year, a leaked document seen by BBC Wales revealed that Ford was projecting a reduction of 1,160 workers at its plant in Bridgend by 2021 if no new projects came into the site.